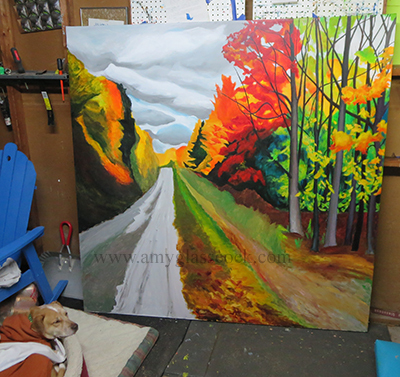 Next I will be painting a scene of the leaves changing in Michigan. Stay tuned for updates. 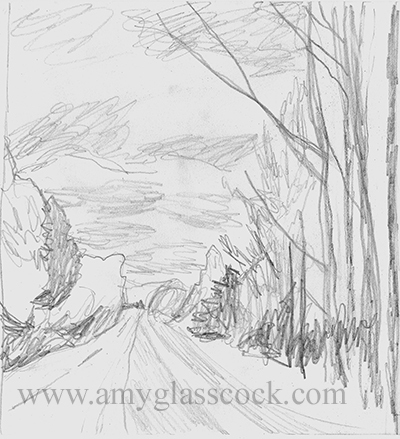 Here is my rough sketch for my giant Michigan fall tree painting with a road in the middle! 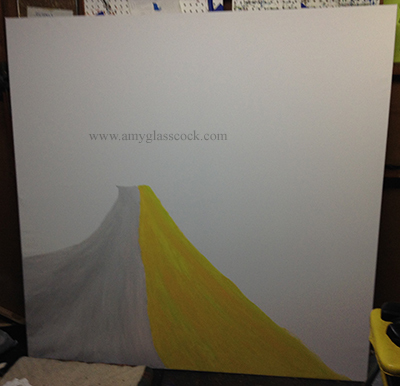 This is a huge painting! 5.5 by 5.5 feet! It took me an hour just to block in this much! So much fun!!! 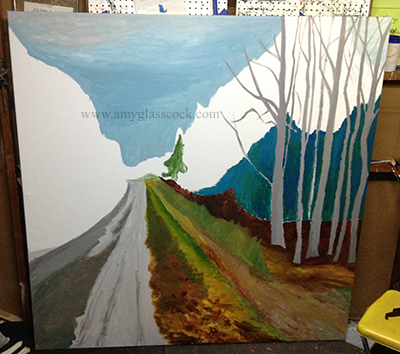 I added to the ground and sky and started blocking in some trees today. 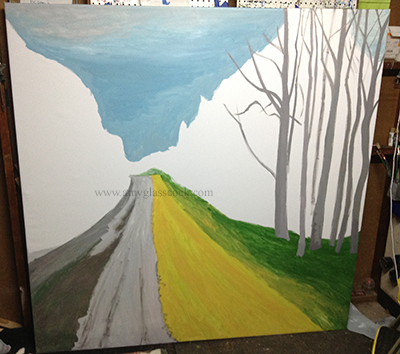 I added more trees and some shading on the road. 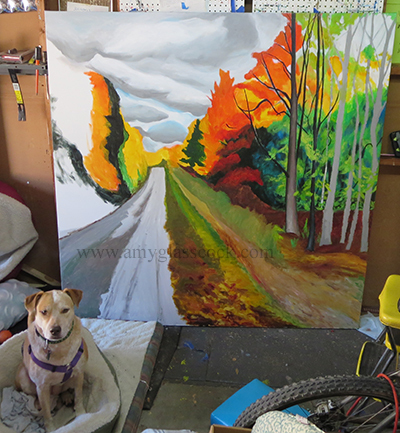 I worked more on the side of the road... 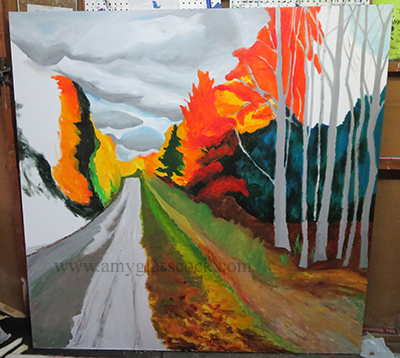 I am trying to get it to look more like leaves on the ground. I also added in some of the background colors on the right side. 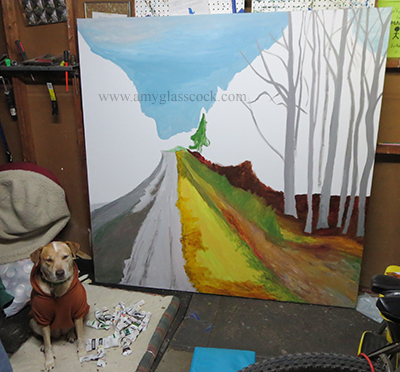 I worked on blocking in the trees in the distance today. I added in some of the darker areas. 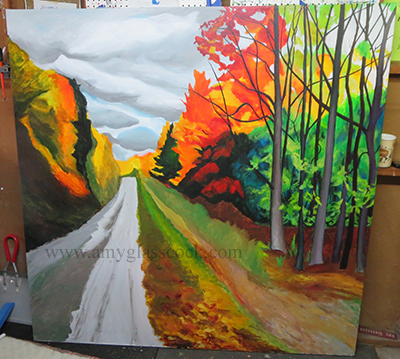 I started adding in some of the yellow, orange, and red leaves. 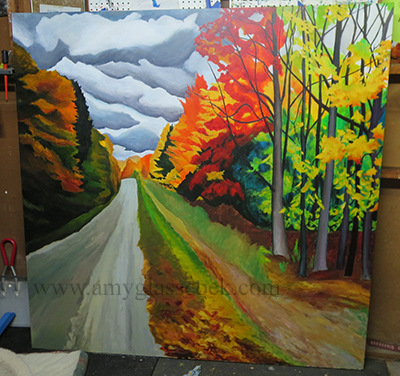 I worked on adding in some green leaves today. 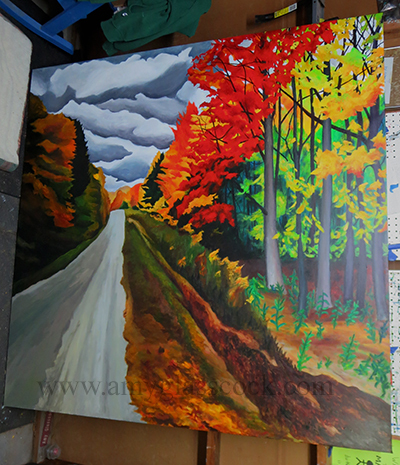 I started adding some contrast on the trees on the right. 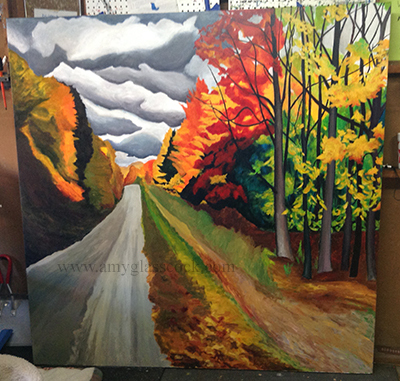 I worked on adding more dark colors to the trees. 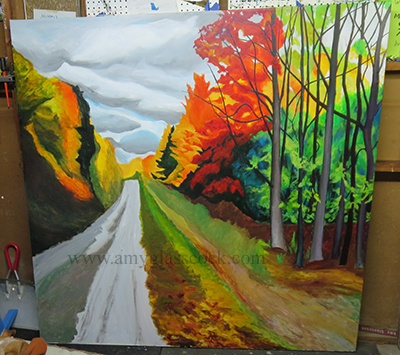 I added some more shadows near the red leaves on the right side. 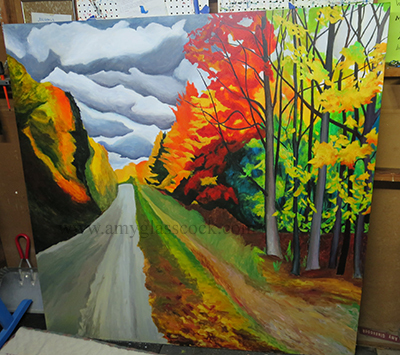 I also started filling in some of the trees on the left side. 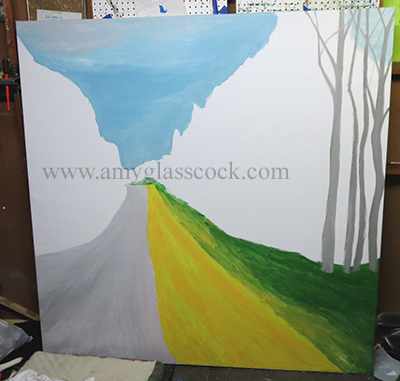 I made some of the branches on the right side longer today. 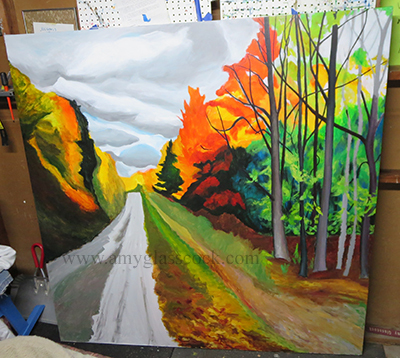 I added more red leaves today. 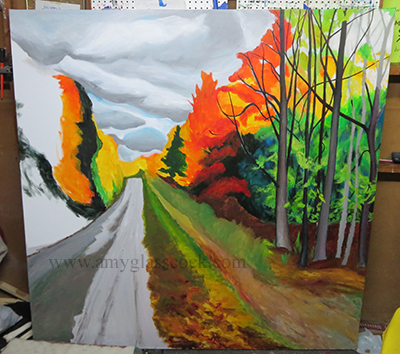 I am still working on the red leaves and trees on the right side of the road. 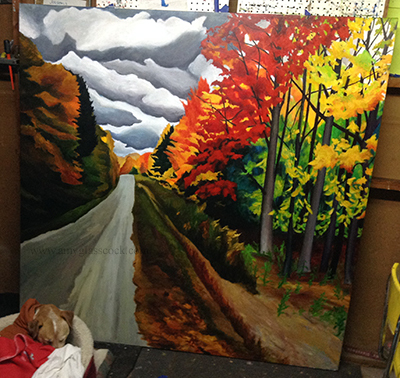 I added a bunch of leaves on the right side today. So many layers of leaves... very complicated. I added some more contrast to the sky today. I used lots of darker blue greys and blue purples. 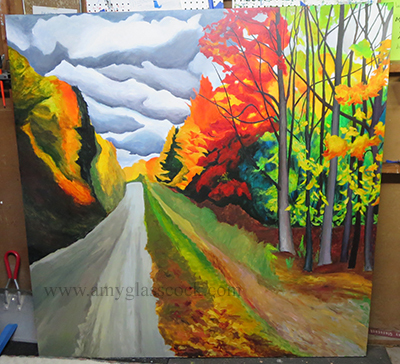 More work on the clouds today. 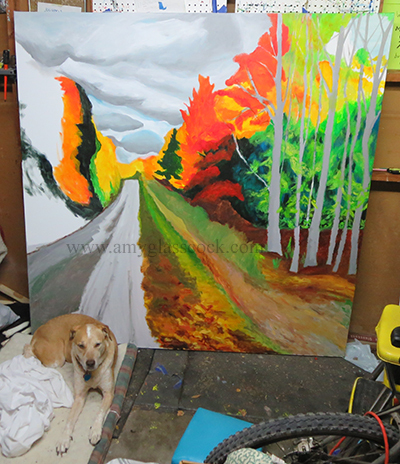 I also worked on the road as well. 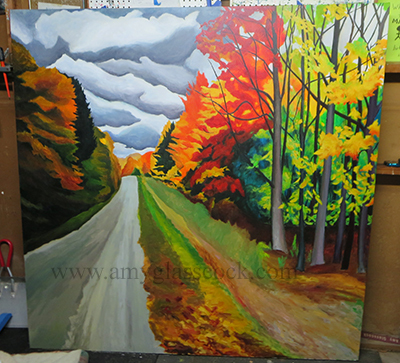 I worked on the yellow leaves in front of the tree trunks on the right side today. 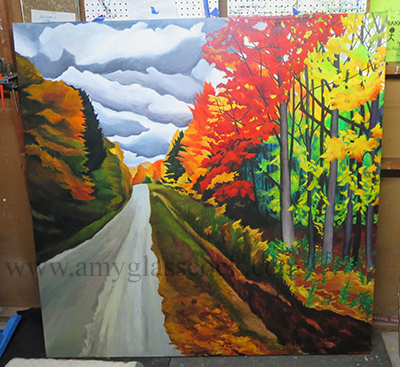 I also added some definition to the yellow tree behind the red tree on the right as well. 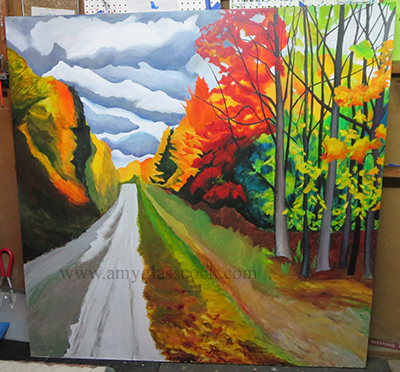 I worked on the trees at the end of the road and also the trees on the left side. 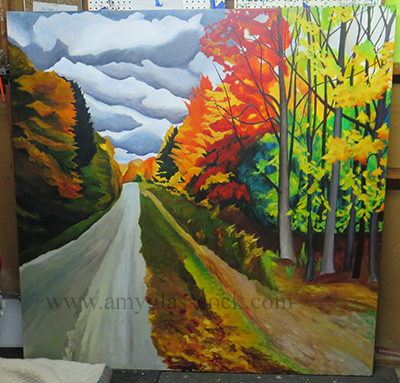 I worked more on the left trees today. 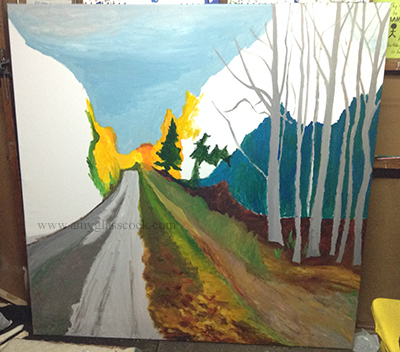 I added a bunch of stuff to the trees on the left side of the canvas. 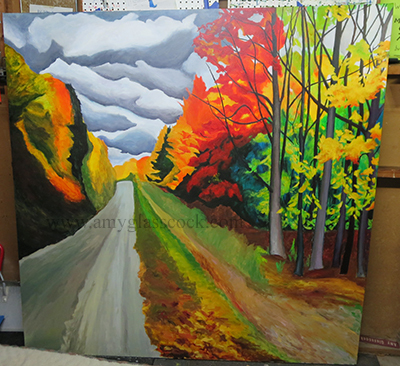 I added details to the dark green tree on the left side as well as some yellow leaves and various brown colors to the right side of the road. 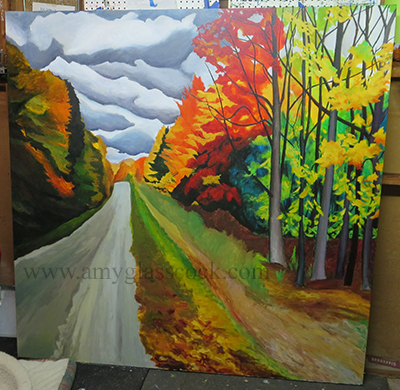 I am working on adding some of the darker greens on the ground on the right side of the road today. 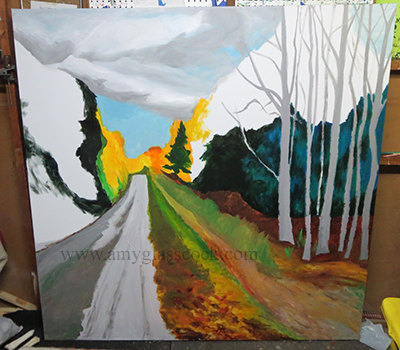 I am still working on the ground on the right side of the road including adding the green plants under the trees.. I also added a few more red leaves to the tree. 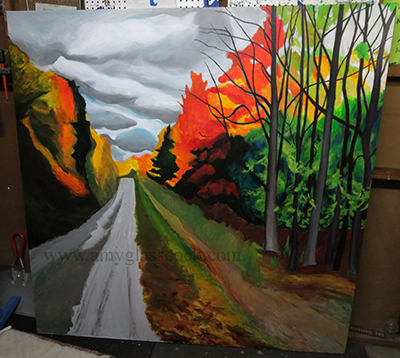 I added more dark browns and reds to the foreground on the right side of the road. 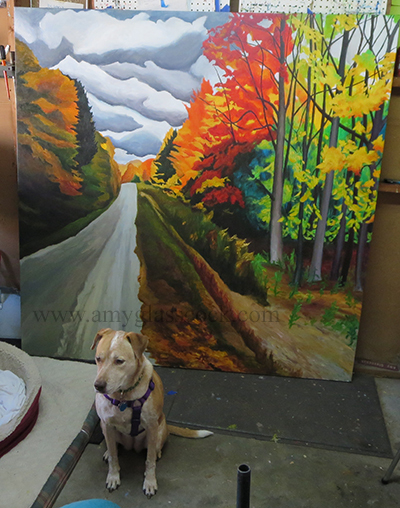 I also added some more contrast to the green plants on the ground on the right side.